Sheffield United will attempt to resist any approaches for in-demand duo Jamie Murphy and Matt Done, The Star understands. Both Murphy and Done have been linked with moves away from Bramall Lane, with Brighton and Wigan thought to be keen. But new manager Nigel Adkins is understood to be under little pressure to sell any of his star players, ahead of next season’s League One opener at Gillingham. After being unveiled as Nigel Clough’s predecessor, Adkins did concede that conversations at boardroom level had taken place regarding Murphy’s situation. 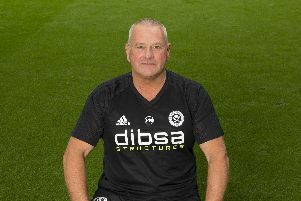 But the young Scot is thought to be settled in South Yorkshire after arriving from Motherwell in 2013, and his partner recently gave birth to their first child. “Jamie is not a player we’re looking to let go,” Adkins, the former Scunthorpe and Southampton boss, said. Done arrived at Bramall Lane from Rochdale in February and scored seven goals in 12 league starts. He finished the season with 22 goals in all competitions. Adkins will get his first glimpse of Murphy and Done in action next Monday, when United’s players and staff return to pre-season training.